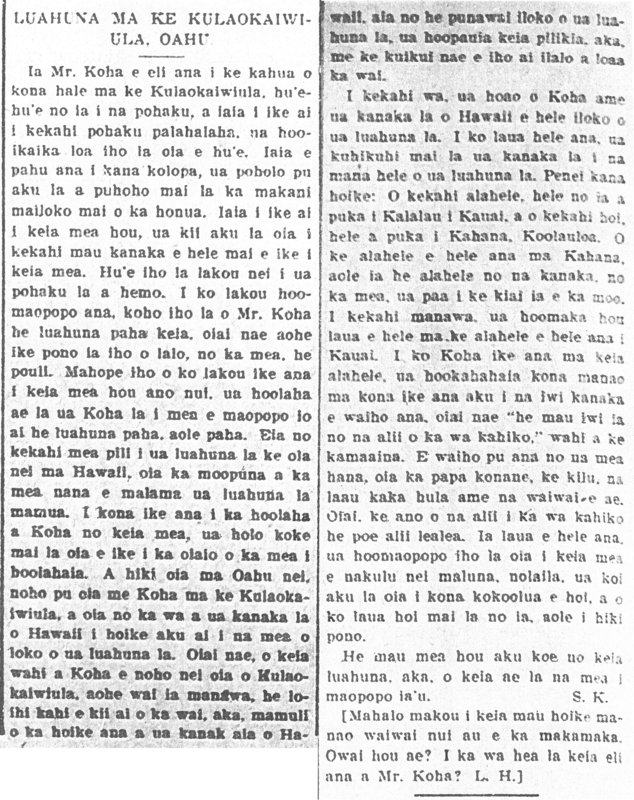 A small window into Koolauloa and Koolaupoko—150 years ago, 1862. Some days ago, we had reason to travel about Koolaupoko and Koolauloa, and because of the many wonderful and beneficial things for the people we witnessed in our travels, we are publishing what we saw before us. There, our eyes were shown things that eased our hearts because of our great joy, when we saw that the kamaaina there did work, and that they did much farming. The one who is leasing the land has started to plant rice; there are perhaps six or more acres. But the somewhat sad thing is the majority of the land suitable for rice cultivation in that Ahupuaa, are just left there without being all farmed; when will it be that if the time is right, we will quickly make up our minds to grasp opportunities to make ourselves rich? Time keeps going quickly. And what of us? Here is what we say, to wake up and to plant your unused loi with rice. A haole there is planting rice, and we hear that it is going well; because he resides there, the work is progressing, and our hopes go with him and those others that are working at this valuable endeavor for us Hawaiians and the nation of our beloved Alii. Waiahole is the first place, in our knowledge, that planted rice; when we began to walk upon the soil of that ahupuaa, our hearts were filled with joy at the sights of that place, and reaching Waikane, all the loi were being farmed, as if it was just one huge farm; we thought to ask who was it that was farming the area, and we were told Messrs. Judd and Wilder (Kale of Kauka and Waila) [Kale of Kauka must be Charles Hastings Judd, the son of Kauka (Gerrit Parmele Judd); so many loi were finely built, and it seemed like almost thirty or more acres; they had thirty-five workers. We see the immediate benefits of growing rice, being that these men were hired, and got paid for their labor, and all this is because of rice; many subjects of the King were provided with jobs, and as a result, perhaps some of those people were prevented from acts which would have caused them to suffer difficulties and problems, because their minds are taken up by work. There are many Loi farmed in Waikane, by J. Fuller (J. Pula), and they are being reworked. The road from Waiahole to Waikane is horrible; it is swampy, and we hear that a horse sunk on this street and its throat was cut. The lower part is boggy, but it is dry on the surface of the earth. There is a fine wooden house standing in Kualoa belonging to Charles Hastings Judd, along with a horse shed, and a carriage house; that place is beginning to become a town. We saw nothing new there, but they did have some rice fields which were located in the uplands; we did not go to see it for ourselves, we just heard of them from the kamaaina; J. M. Kapena and Asing Apakana are the ones doing the farming. This is the rice growing lands of Dr. [Seth] Ford (Kauka Poka) them; they built a wooden house for themselves and a halau for the workers who number 35, and they work without any complaints. Dr. Ford them slaughter two cows as meat for their men for a week. The area that was plowed up is between thirty and forty acres and it is ready to be planted with rice. The work there progresses due to the good treatment by the bosses to their workers; they are anxious to work for Dr. Ford. We all know that if we treat others well, we will be treated well and with aloha. We saw some well-farmed land to the southwest of the Church, and the land all about is green. This shows the benefits of the recent showers. We arrived there at 4 in the evening, and met pleasantly with the Konohiki of that land, and rested our limbs at his house. Captain H. S. Howland (Haulani), the Konohiki of that land is starting to build a wooden house there. Here however is the problem, that being the long wait for the lumber and the other house building materials, because of the delay and the inattentiveness of the captains of the ships that travel there; we believe that if there was a ship that went regularly to Koolaupoko and landed at the harbor of Koolauloa, the materials needed for the Owners [of land] would always be there. After making a start at the home of the landowner, we went to the houses of those living on the land, and we were urged on by an astonishing idea, to question the people of that area about their life under their new landlord. And we are happy to report to our friends, their answer was that their life was very pleasant, without any admonishments or reproach; and because of their great aloha and appreciation for Capt. Howland, they went and gave him many gifts—taro, pig, chicken, and many other things, without pay; it was as if he was a native-born alii; also, they all went quickly to assist him, with things that Capt. Howland needed, on their own accord, without being coerced by him. One kamaaina of that area did not touch work in the least when the land was under the previous Konohiki, but with Capt. Howland, he came to work industriously without complaint, but enthusiastically, without being forced to. The new Land owner of Laie lives together with the people of his land, like brothers of the same family. How pleasant is the life of people like that! The reason for their love is because their landlord gives them many things, and does not just burden them, or put a restriction on plants or things from the sea. The one who owns the land just wants to live together in peace, and to search for together things that will benefit them all. How could there be no appreciation and love if we treat others well? It is good to remember this, to remind us to treat others with aloha, so that we are loved, when the day comes where we will be blessed to become land owners. There was so much commotion amongst the Hawaiians and haole at the news that there was Gold in Kahaluu; there were many people who came from Honolulu to the place where Gold was thought to be. Many Hawaiians from Koolaupoko came with Oo, Pickaxes, Shovels and other things, preparing them to dig. When it was heard that there was real Gold on that land, the news flew from house to house like firebrand. Those who first spotted it went immediately, making ready with dynamite powder. However, before those people who first witnessed the Gold reached Kahaluu, the news reached the people of that land, and they were roused. Therefore, about 60 kanaka maoli and 2 haole got together with weapons to expel all those who came to that area thought to have Gold. So when the haole came that wanted to ascertain the truth or falsehood of the Gold of that place, they were sent away. Following that time, a hole was bored into a rock to place dynamite and explode to see if there was Gold within it or not. People stood together there waiting in anticipation for the rock to break. In the evening of the 18th, the hole dug in the rock was finally deep enough, and it was blasted, and the rock was shattered, the tiny pieces flew. There was however no Gold found. Many pieces were taken to Honolulu, and were looked at by experts, but there was no Gold found. Ka Nupepa Kuokoa, Buke I, Helu 13, Aoao 2. Feberuari 22, 1862.